Now, before anyone goes and gets too excited, let me stop you short and say I'm referring to our dog, Three. For some reason when people see dogs they automatically refer them them as "he" as if all dogs on earth are males. I much prefer a female dog since there's not "stuff" to contend with when you want to flip them over for a good ole tummy rub. We have been getting tired of the "How old is HE?" and the "What's HIS name?" questions so we got Three a new *pink* collar this weekend and she's as cute as a button! 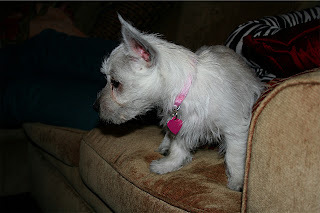 She had the same pink collar only smaller a while back (pic), but she's since grown out of it and was wearing an NCSU collar (which is admittedly boyish). Her name tag was a pink heart, but that didn't stop the boy comments from coming. She's adorable now, and very happy in her pink collar. I was on the hunt for the cutest collar I could find, but it seems most of those are 1" collars which is just a big big for our 14 pound puppy. Hopefully now the pink collar will squash the urge for folks to call her "him." I'm still on the hunt for something cute and girly, but now I'm not in a rush! so where are the pics??? What a beautiful girly girl puppy dawg:) My sweet Three in her cute pink collar:) Who loved our walk on the Tobacco Trail yesterday. Who barked at the big horse like she was a big scary girl:) Makes a grandmama proud!! !